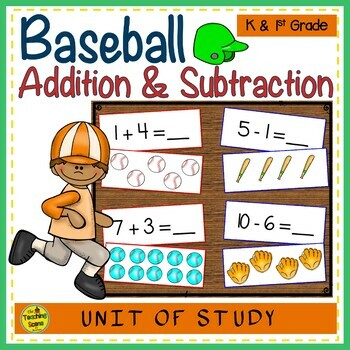 Baseball Addition & Subtraction Number Sentence Match Game is an easy prep math game for students to work on their addition and subtraction facts from 0-10. Resource Prep: Print, laminate and cut all cards and pieces to the activity. Note: You can choose to do all the cards or take out the number cards you are working on at the time. 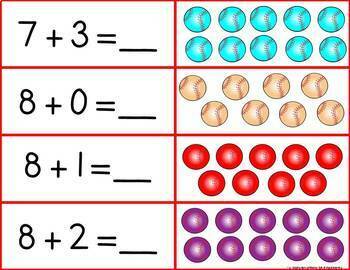 Baseball Addition Number Sentence Match Game: (0-10) Students match the addition sentence sum with the amount of baseball items on the cards. This game can also be played as a matching game or memory by limiting the amount of cards to play with. 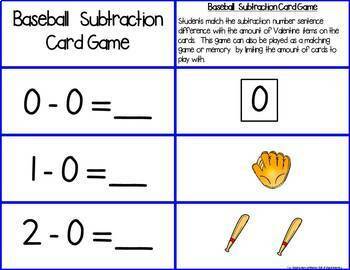 Baseball Subtraction Number Sentence Match Game: (0-10) Students match the subtraction number sentence difference with the amount of baseball items on the cards. This game can also be played as a matching game or memory by limiting the amount of cards to play with. 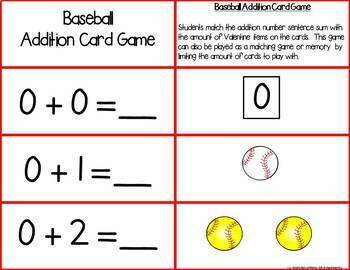 Kids have some baseball themed fun while learning their addition and subtraction math facts to 10!